What began as a capital campaign for an aesthetic makeover to Christ Church Day School (CCDS) changed course in the wake of the Sandy Hook tragedy and an overall trend in escalating school violence. CCDS students are now enjoying the benefits of new high-tech systems and upgrades in their classrooms and their parents are breathing a bit easier now that security systems have been upgraded throughout the campus. The idea for the school improvement project began when Edward Harrison became the rector of Christ Church in 2009. School officials were already on the road to a campus renovation when the Sandy Hook shootings occurred in December 2012. Attached to the stone parish church, which was designed by noted architect William Hebbard in 1894, was a red-brick school building from the 1950s. “It was just jarring — there was no integration or harmony,” said Harrison. His vision for CCDS included a full-scale upgrade of the school’s physical infrastructure, a modernization of technology available to educators, and significant enhancements to aesthetics of the entire campus. 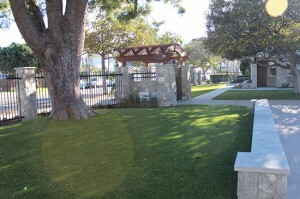 “The most pressing need at the time was the restoration of the property and general maintenance. The school also needed more space,” said Christ Church parishioner Mark DeMichele, who headed up the capital campaign. While its 105 students were on summer break last year, the 57-year-old school underwent a major renovation. Christ Church raised more than $2.1 million from parishioner and parent donations. With funding secured, the school commissioned local architect Christian Rice to design and oversee the project. “We were anxious to get most of the work done in time for school to reopen in September,” said Harrison. “At one point we had 50 people working at once.” The school did indeed open on schedule, but the construction continued on weekends until February, when minor finishing touches were put on the project. Perhaps the most significant new safety feature is the main gate that provides access for the students and staff. While keeping a classic look, the gate now only opens from the inside or when unlocked from the outside with a special code. “The gate can be programmed for nighttime functions with special codes for designated hours” explained DeMichele. Safety in classrooms was boosted by the addition of frosted windows and doors that lock automatically, allowing the campus to always be locked. Before, there had been no way to lock the building down in case of emergency. Each new door is also equipped with a panic bar to enable students and teachers to exit the building quickly in case of an emergency. 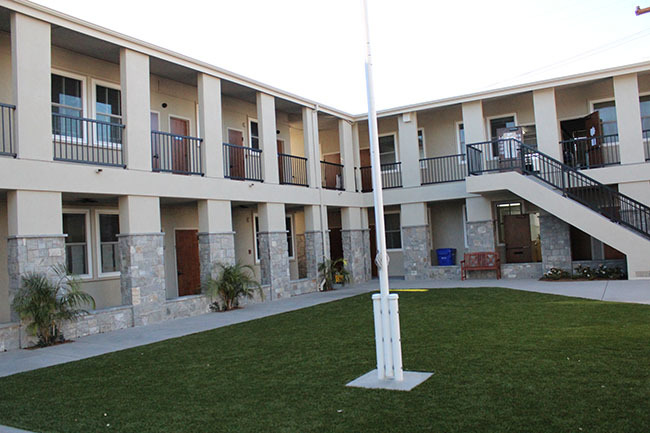 Hand-cut stonework, the most expensive material in the building process, was laid as siding on the classrooms and built into benches around the courtyard, enhancing the overall aesthetic and providing more seating for the children during lunch and recess. The school entrance now boasts an electronic announcement board embedded into the new stonework. It alerts students, parents and community members of campus news and events. New entrance landscaping incorporates plants and vines that will eventually grow into the woodwork above the campus’ main gate. To resolve the lack of space for its music program, the school reworked “the cottage,” located across the street from the main campus, into a music education room. 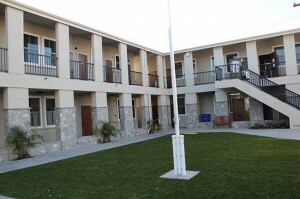 All buildings received new roofs and air conditioning systems. A parishioner funded artificial turf for the school’s entire courtyard. Not only does the turf significantly reduce the amount of water consumed annually by the school, it also reduces mud tracked into classrooms. All classrooms were revamped with new paint, wiring, corkboards and cabinetry. 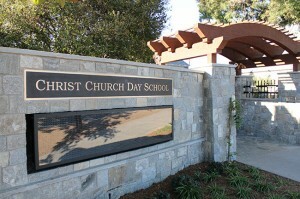 Christ Church Day School’s new gated entryway and electronic announcement board. 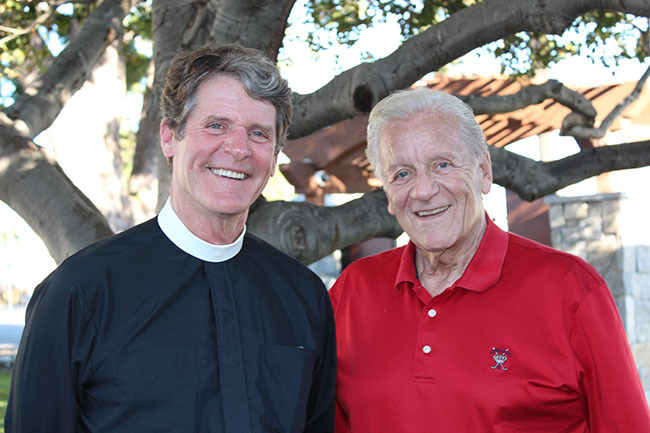 Christ Church Rector Edward Harrison and parishioner Mark DeMichele, who headed the project’s capital campaign.